Please note that in addition to the Club's bonspiels listed above, the bonspiels listed below are private rentals of the Club's facilities and appear on the Club's Events Calendar. Hospice Georgian Triangle, Saturday, October 27, 2018. 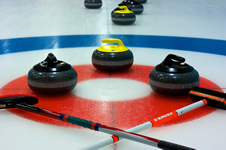 Men's Probus Bonspiel, Thursday, February 7, 2019. The Breaking Down Barriers Bonspiel, Saturday, February 23, 2019. Copyright © , The Curling Club of Collingwood , All rights reserved.